With the devastating effects of Hurricanes Harvey & Irma all over the news lately, we've been getting a lot of questions about flood coverage. It's important to note that flood damage is typically not covered by your homeowners or renters insurance. There are specialized flood insurance policies that can be purchased to protect your home and belongings. Water / sewer backup coverage can usually be added to your policy for an additional premium. It's an important coverage to discuss but it does not cover water damage that seeps in through the ground or walls or that comes in through windows or doors. Water / sewer backup coverage is designed specifically for water damage that results from a backup of sewers or drains, or is a result of your sump pump not keeping up or not working. Elevate your furnace, water heater and electric panel in your home if you live in an area with a high flood risk. Consider installing "check valves" to prevent floodwater from backing up into the drains of your home. Move immediately to higher ground if there is any possibility of a flash flood. If you need to evacuate, secure your home and move essential items to an upper floor. Disconnect electrical appliances. However, do not touch electrical equipment if you are wet or standing in water. Do not walk through moving water - it can make you fall. Use a stick to check the firmness of the ground in front of you. Make sure your city's water supply is safe to drink. Flooding is one of the most common hazards in the U.S. Being prepared for any emergency is crucial for the safety of you and your family. Don't be caught off guard! Learn more by visiting the American Red Cross website's flood safety page. 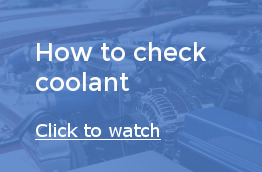 Coolant works with the radiator to keep your car from overheating. You should check your coolant twice a year.